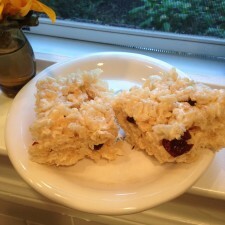 The first time I made rice krispie treats for my daughter it was because she was in a bit of a food rut. (Or maybe I, being the one who does the shopping and the cooking, was.) I saw a picture of the childhood delights in a magazine or something and started wondering if there was some way that I could make those classic marshmallowy rice bars, but give them a bit of a health kick. So I used popped brown rice (rather than the traditional name-brand cereal), replaced the butter with coconut oil, and I added dried cherries and cranberries. Would you believe it – they were delicious! They still have marshmallows (if you find a way to get around that I hope you’ll let me know!) but otherwise they’re not half bad for a treat! Heath the coconut oil in a small pan, slowly stirring in the marshmallows until it’s creamy and gooey. Pour the cereal into a bowl and add the marshmallow mix, stirring until mixed together. Pour into a greased 9×9” pan. 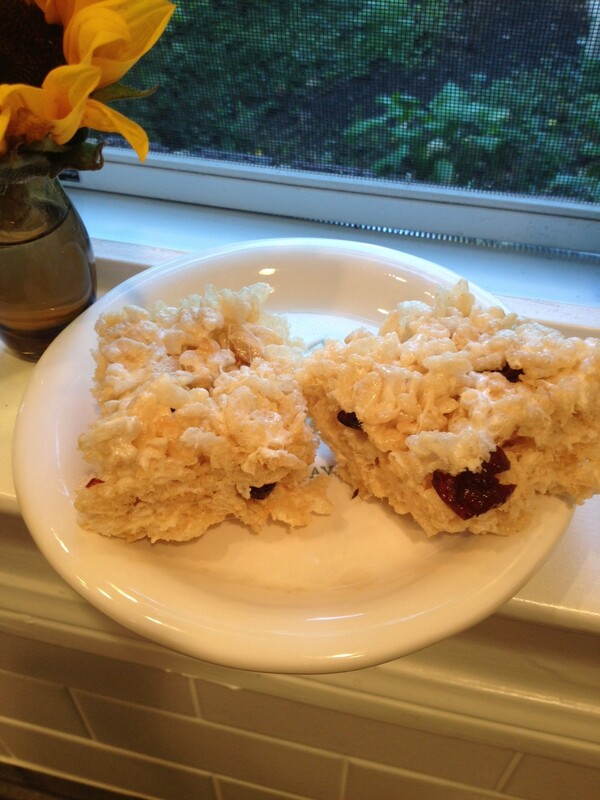 For “hidden treasures” tuck the cranberries inside the mixture while it’s still warm enough to manipulate. Otherwise, spread the cranberries across the top. You could also stir the cranberries in while the mixture is still in the bowl. Set aside to cool for 30 minutes then cut and serve.